PL (liberals): Strong liberal credentials, comfortable with their Romanian identity. PLDM (liberal democrats): The best run party in Moldova. Promotes both liberal and social democratic values and sees themselves as Moldovans. AMN (our Moldova): The true centre of Moldovan politics; a party capable of appealing to all ethnicities. PL, PLDM & AMN together: The three parties that deserve the votes of Moldovans and present the best hope for the future. They need to up their work-rate, however, in the face of continuing massive pressure from the communists. MAE, PNL & PC: Three small liberal parties whose hearts are in the right place but whose egos are getting in the way of an opposition victory. Even if they need to contest the election for technical reasons (i.e. to avoid deregistration), they should ask their supporters to vote for one of the major opposition parties to ensure that votes aren't wasted. PD (democrats): A small centrist party now taken over by Marian Lupu and his associates. Could serve a useful purpose if it pulls votes away from the communists. Could also form the base for a modern social democratic party. The risks are very high, however, that the PD is just a front for the communists or the Russians. Only vote PD if you can't bring yourself to vote PL, PLDM or AMN. PPCD (christian democrats): A small communist-allied party now trying to position itself as a mediator and the voice of reason. Remember however that during the early years of communist rule these were the guys screaming "down with communism" and waving Romanian flags around. They have about as much credibility as Bernie Madoff and I'm not sure that their seven leading candidates have started shaving yet. Avoid. PCRM (communists): A gang of mad & violent totalitarians who wouldn't know what democracy was if it ran over them in a truck. Re-election of the communists will be the final nail in the coffin of Moldovan democracy and human rights, and will condemn another generation to poverty. DO NOT VOTE FOR THEM. NOT NOW. NOT IN THE FUTURE. NEVER. Ravnopravie, Patrie/Rodina: Two small russophile parties that are even nuttier than the communists. The Omega news agency has an article posted about the OSCE parliamentary assembly that has just started in Vilnius. In the article, Omega makes the claim that the members of the assembly have received a report on the April 5 elections which states (in terrible, subject-confused Romanian) that "the expression of the will was recognised transparently, democratically and which corresponds to all international standards". The source document is pages 12-14 of the OSCE PA's 'Background report'. This report unfortunately draws on the OSCE ODIHR election observers' much-criticised preliminary report rather than the much more balanced and well-researched final version. Nonetheless, it appears that Omega didn't even think that this wording was fit for publication without a little doctoring. The phrase 'expression of the will' is nowhere to be found in the OSCE PA background report (although it did appear in the ODIHR preliminary report). The words 'transparent' and 'democratic' do appear, but not in the context quoted by Omega. Both reports use the phrase 'corresponds to many international standards' in referring to the election process. Not that senior OSCE staff later clarified that 'many' does not even mean 'most', i.e. the April 5 election only corresponded to a minority of international standards. I don't think the phrase was used at all in the final ODIHR report. Amazingly, however, Omega have taken the liberty of replacing 'many' with 'all' in their reporting, giving the impression that the election process was near perfect even though the final report said it was anything but. By now I expect the "journalists" at Omega to spin their news reports in favour of the communists. I didn't think they would stoop to fabrication, however. In one of its dying acts, the recently dissolved parliament (legislative branch) gave the government (executive branch) the power to issue emergency ordinances. An emergency ordinance is basically a piece of temporary legislation that has the force of law from the date it is introduced, but which has to be confirmed by Parliament within a certain period. Article 6 of the Moldovan constitution states quite clearly that legislative, executive and judicial power are separate. The government is not allowed to wield both executive power (its day job) and at the same time wield legislative power (through emergency ordinances). Article 60 (1) states that Parliament is the only legislative authority of the state. "Do not give dogs what is sacred; do not throw your pearls to pigs. If you do, they may trample them under their feet, and then turn and tear you to pieces"
My interpretation of this is that it doesn't make sense to try and debate people who are unreasonable and who have no intention of listening to your side of the argument. Such people will instead take whatever you say and twist it to their own purposes, often using it against you. This is the strategy currently being used by the communists and their fellow travellers in Moldova. They are lying about the opposition's role in the April 7th violence, just as they lied about Romania's. They are lying about the nature and the extent of the police brutality that followed he protests. They are lying about the independence of the press. They are lying about the state of the economy. They keep repeating these lies and suppressing dissent in the hope that the lies will eventually be accepted as truth. The truth itself will unravel this strategy, however. If we confront the lies with the truth whenever and wherever they are told, Goebbel's method will fail. As noted above, this doesn't mean getting into debates with the unworthy, just setting the facts straight so that naive readers aren't led astray. Having been turned down by western donors lenders (due to corruption and the PCRM's lax fiscal discipline), we were treated this week to the sight of Voronin and Grecianai heading off to Moscow, cap in hand, to beg the Russians for money. This is a vitally important issue. It is an open secret that Moldova is bankrupt and will have extreme difficulty paying pensions and government salaries in the lead up to the July 29 election. Remember that pensions were increased just before the April 5th election, exacerbating the country's current financial situation. Remember also that the communists were, until very recently, in denial about the impact that the global recession would have on the Moldovan economy, primarily through decreased remittances from Moldovans working overseas. The key issue is this: should the PCRM fail to make the July 20 pension payment, a large chunk of their electorate will desert them and it will be all over for the communists. Apparently its all sorted now though - Voronin and Grecianai have returned from Moscow with a pledge from Medvedev to provide $500m of credit. This has naturally been trumpeted by the state media alongside footage showing Voronin in a position of honour alongside Medvedev at a remembrance day ceremony in Moscow. 1. Kazakhstan was promised several billion by the Russians some months ago, but hasn't seen a kopek yet. Kyrghyzstan is in a similar situation with respect to the $2bn bribe the Russians used to get them to close the US air-force base at Manas. 3. Voronin has breached Moldova's own budget law in accepting the credit. This law states that, in 2009, the national debt is not allowed to exceed $841m. It already stands at around $800m. As parliament is now out of session, this law cannot be changed prior to the election. So we're not talking about real money here. Rather, we are viewing political theatre intended to reassure the ignorant Moldovan masses about the competence of the PCRM government and the backing it enjoys from big brother Russia. Let's hope that the Moldovan masses aren't that ignorant and let's do everything in our power to enlighten them. In a first for Moldovan democracy, the anticipated elections are to be held on a weekday. This date (April 29th) has been declared a holiday in Moldova to facilitate voting. It is perfectly legal under electoral law for the election to be held on a weekday. The problem is that it is not a holiday in other parts of the world where Moldovans live and work and from where they send home money to support their families. For these people, voting is already difficult enough, as they have to travel to a city in which there is a Moldovan diplomatic representation (and there aren't many of these). Now they are supposed to do this mid-week. For many this will be impossible due to commitments to their employers. This is not an accident. Overseas Moldovans voted overwhelmingly for the opposition on April 5th, and the Communists are now trying to disenfranchise them. That is evident from the fact that the parliament found time to make certain amendments to the electoral code but did not find time for making it easier for overseas Moldovans to vote (e.g. through postal or internet voting or through setting up other polling stations). Note, however that the constitution demands demands that the vote be 'universal', i.e. that all eligible citizens are able to participate. Through their actions, the communists have undermined this basic constitutional right by denying overseas Moldovans the opportunity to vote. This action should be condemned by the western powers and attacked at the ECHR. At time of writing, it appears that Marian Lupu may head the Democratic Party list going into the anticipated elections. His presence, together with the lowering of the hurdle to 5%, should be enough to get the DP into the next Parliament, possibly holding the balance of power. The DP is an uncertain commodity. Its leader, Dumitru Diacov, has in the past betrayed his electorate, the most notable example being his support for Voronin's 2005 presidential candidacy. Diacov's lieutenants, Oazu Nantoi & Oleg Serebrian, have somewhat stronger democratic credentials, however doubt still remains about how this party would behave if given the balance of power. They talk a lot about 'mediating' between liberals on the right and communists on the left. Potentially, this means they could be bought off by the Communists. Here, the Democrats need to draw a distinction between normal political debate and fundamental democratic norms. Normal political debate concerns things such as economic policy, foreign policy etc. Here the DP should feel free to vote with the PCRM if that is what its electorate wants. Fundamental democratic norms are a different matter. They are not a subject of left-right debate and should be adhered to by all parties. They are codified in both the Moldovan constitution and in the European Parliament's resolution. On these issues the DP needs to be staunch and align itself with the liberals. Accordingly, the DP should not support the presidential candidacy of any person whose track record on defending democracy is compromised. That basically means the entire PCRM, together with Lupu and Diacov themselves. If the DP wishes to prove its commitment to democracy, it should come out before the elections in support of an Urecheanu candidacy. Moldova has a complicated political landscape. As with most countries, there is a left-right economic axis ranging from hardline communism (total state control over economic activity and heavy redistribution) to economic liberalism (the most minimal role possible for the state & no redistribution). In Moldova, however, there's an even more important axis, which has to do with ethnic identity. It ranges from those who see themselves as part of the slavonic world through various shades of moldovan identity to those who see themselves as Romanians. In the image, I've attempted to plot the positions of Moldova's political parties on these two axes. These are just my views, so please let me know if I've got anything wrong. I am no great fan of Marian Lupu, but nonetheless his decision today to leave the PCRM could prove to be a significant turning point in the political crisis. There is a strong view abroad that he is being sent into the democratic camp as a trojan horse, with the aim of stealing a couple of seats in parliament from the three liberal parties and hence assuring the election of a communist president. That's very possible, however on the evidence we have it would appear that Lupu has simply fallen out with Voronin, understands that the PCRM is on a downward trajectory and understands that he has no future within that party. His statement today, in particular his reference to the non-fulfilment of the EP's requirements by the PCRM, would indicate that he has definitively turned his back on the communists. 1. Hammer away at each line of the EP resolution. Demand the freeing of political prisoners, the independent investigation of of the violence and torture of the week of April 7th, the investigation of election fraud, the freeing of TRM, the cleaning of the electoral roles, the improvement of electoral processes and the reestablishment of friendly relations with Romania. 2. Rather than trying to cobble together a centre-left party from the flotsam and jetsam of the PD, PSD and UCM, Lupu should join AMN and submit to its party discipline. He should place himself at no. 12 on the list so that he would only enter parliament in the event that AMN increases its April 5th vote. 3. Encourage other members of the PCRM's liberal wing to leave and join him at AMN. 4. Commit to not voting for any president proposed by the PCRM. This list is probably not exculsive - if you have other ideas, please leave a comment. The 'Our Moldova Alliance' ("AMN") is the smallest party in the parliamentary opposition, and, according to some accounts, is in danger of failing to clear the 6% threshold at the anticipated elections. 1. AMN can capture the votes of non-communist rusophones, who currently vote for the likes of Tarlev or Braghis. AMN takes a 'moldovenist' view of the identity question and does not promote reunification with Romania. AMN does not want Moldova to join NATO. Urecheanu strives always to maintain good relations with Russia. 2. AMN can capture the votes of rural pensioners, a group which has voted heavily for the communists in the last 3 elections but has no strong allegiance to them. Of the three opposition parties, AMN is the strongest in the countryside and the most representative of older voters. Together with a partial reversal of the April 5th fraud, a broadening of AMN's support should be sufficient to win the opposition 51 seats in the upcoming election. Now that the euphoria of 'keeping hope alive' in Moldova is starting to wear off, we need to think about what is to be done. 'Shto delat? ', as a badly transliterated Lenin would have said. Today's vote was a major victory, but not a decisive one. To rid Moldova of the Communist / Russian threat, the 'reliable' opposition needs to win 51 seats in the anticipated elections, i.e. a simple majority in Parliament. With 51 seats, they can write legislation to free the media and they can democratise Moldova's electoral laws. With those two things done, the PCRM would be sure to lose further ground in any subsequent election and would be prepared to forestall this by voting for an opposition president. 1. Build a unified, but still credible opposition. The three liberal parties should form themselves into a single 'Liberal Alliance', if only for the electoral period. Trusted outsiders (e.g. the Conservatives) should be brought into the list. The one or two percent of the vote they will add could be decisive. One the other hand, the credibility of the opposition shouldn't be undermined by bringing onto the list the likes of Braghis & Diacov, who have aligned with the PCRM in the past and have a fundamentally different vision for Moldova. 2. Get the message out about the April 5 fraud, the April 7 conspiracy and the April 8 terror. The TRM brainwashing needs to be counteracted and the best method of doing this is by word of mouth. Opposition supporters need to talk extensively with their families and friends in the villages where ProTV and the internet do not reach. Written materials need to be produced, printed & distributed widely. Even if all they can do is turn former communist voters into poll 'no-shows', and 'no-shows' into opposition supporters, that will probably be sufficient. 4. As requested by the Liberals in parliament today, the western powers also need to send in credible teams to oversee various aspects of democratic activity during the campaign period. In particular we will need real election observers, note the fakes we had to put up with last time around. These should be professionals from the countries with the strongest democratic traditions and little direct interest in Moldova, i.e. the likes of Finland, Denmark, Canada and New Zealand. It is pleasing to see the Moldovan Communist party start to go ragged at the edges. 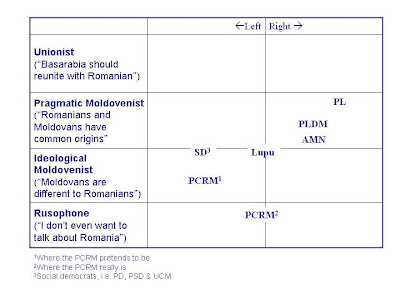 Over the last two days we have been treated to (a) Marian Lupu's statements to the effect that the PCRM is 'unreformable', (b) Turcan's admission that he organised the raising of the Romanian flag over parliament and (c) Voronin's rather pathetic attempt at negotiating with the three liberal parties prior to the vote this morning. The piece de la resistance, however, came during Vlad Filat's blunt and direct statement to Parliament following the vote. At one point the Communist deputies completely lost the plot and started stamping their feet, banging on the tables and randomly playing the melodies on their mobile phones. Hopefully at the next session on June 10 we will be treated to the sight of them knocking back bananas, scratching their underarms and picking the fleas out of each other's fur.